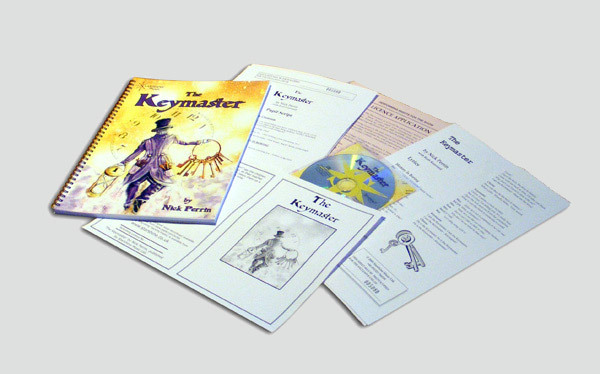 Director's Book, CD*, Photocopiable masters and a Performing Licence application form. More details below. Need to start quickly before your pack arrives? For just £2.50 extra you can choose to add on our digital QuickStart download when purchasing a Director's Pack. This download includes:- Director's overview, cast list, pupil script, lyrics & complete mp3 song demos (all included in the hard copy pack) which you can start using before your hard copy pack arrives. To access this service customers need to register or login to their account and purchase the Director's Pack with Quickstart using credit card or PayPal. The digital download will be available as soon as the payment goes through, which is normally instantly. Please use our digital downloads responsibly. They are licensed to you, for use in your production, within your school or organisation only. Legally they are covered by copyright law. Please respect this. Click HERE for terms & conditions. An Instant Performing Licence applies to performances where there is either no entry charge or the maximum charge/voluntary contribution is less than £1.50 per seat. The IPL allows any number of performances within 12 months of the product purchase date. Purchasing an Instant Performing Licence may save you money but these licences must be purchased at the same time as a Director's Pack. When purchasing/ordering an IPL there is no need to complete the performing licence application form, as a pop-up IPL add-on order button will appear when you order a Director's Pack. You need to use the performing licence order form if the average ticket/contribution price is £1.50 or more, if you have bought a Director's Pack without a licence and now decide to perform the show and /or are repeating performing the show in a subsequent year. CD* - Complete vocal demonstrations by children for children. Full instrumental backing tracks for performance purposes, with clear melody line cues. Designed for easy teaching and great performances. No pianist needed! PHOTOCOPY MASTERS - These come either as printable pdf files on the enhanced CD or A4 loose-leaf sheets registered to the purchaser for copying purposes. Includes Pupil Script, separate Lyric Sheets (condensed and clearly laid out), and Programme Template - an A4 sheet for folding into A5 programme with show title and picture on the front, synopsis on back with blank spaces for your details. Blank centre spread for cast list etc. *CD - some of our products come with an enhanced CD which contains the printable files of the photocopy masters and programme template. OPTIONAL EXTRA - A PowerPoint Presentation for use with data projectors, PCs, Macs and interactive whiteboards is available for all our songbooks, cantatas and children's musicals once the product has been purchased. The lyrics are clearly laid out with quick links to all the songs. Each PPT is FREE to schools/organisations that have a CCLI licence (includes all state schools in England with an URN) or £5.00 per product. Either way, just email info@starshine.co.uk with your CCLI no. or request a £5.00 purchase invoice and the PPT will be emailed to you. 'Thank you for your prompt service. I am hugely impressed with your company: both the quality of your products and your customer service. Keep up the good work.' Caroline Skerry - Teacher, Bodmin.